Just after he is fired from his job pitching for the Hackensack Bulls, Montgomery Brewster (Richard Pryor) learns he is the sole heir of Rupert Horn (Hume Cronyn), a great uncle he never knew he had. According to the terms of the eccentric multimillionaire's will, which he recorded on film, Monty will inherit $300 million - if he manages to spend $30 million in a single month without acquiring any assets. But he can't tell his best friend, catcher Spike Nolan (John Candy), or the accountant keeping track of his expense, Angela Drake (Lonette McKee), the truth… and everything he tries seems to backfire! This hilarious version of the classic "big money" comedy, first filmed in 1914, was directed by Walter Hill (48 Hrs.) 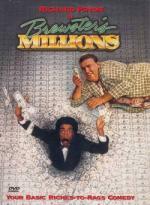 and adapted from George Barr McCutcheon's novel by the writers of Trading Places. I really don't know what it is about this movie... but it has been a long time favorite of mine. I just have always found this movie wildly entertaining with a lot of laughs. I couldn't imagine spending $30million in 30 days and not have anything to show for it... but he really comes up with some wild ideas. I think my favorite idea of his has to be him buying.... and then mailing that rare stamp. That was just fantastic. I do think this movie ended just a little short for my taste... I would have liked to have seen his friend's reaction to the reason he spent all that money the way he did. But other then that this is a good... fun movie. Unfortunately the DVD had no extras what so ever... not even the trailer! I really enjoyed all you mentioned... but I am ashamed to say out of those mentioned only Brewster's Millions is in my collection! lol.. unfortunately not much I can do till after the Holidays... I am on restriction... no DVD Buying for the rest of the year! Don't give up hope Pete...maybe one of your friends will cull their collection and send you more DVD presents! LOL.... I can hope... already have one of my friends saying she is putting a couple to the side for me.... but don't think she will be sending any time soon. She likes to make it worth sending and have several to send at once. This is a movie my daughter bought with some of her Birthday money recently... and I was glad to see her bring it home. I love superhero movies... and I am a fan of Tim Allen so I was looking forward to watching it. I have read a few reviews of this movie... and every one of them basically said this movie sucked. I can't agree with that though. You do have to remember that this movie is more geared towards the family... especially with kids in mind... but it is a fun movie to watch. You just can't expect anything more from it then that. Just a fun... leave your brain at the door type superhero movie. If you expect anything more then that... yes you will be disappointed. But if you go in expecting nothing more then a good time with a handful of laughs I think you will enjoy it. That is my opinion at least. Robert Townsend ('Hollywood Shuffle')leads an all-star cast including Marla Gibbs, Eddie Griffen. Robert Guillaume, James Earl Jones and Bill Cosby in this laugh-out-loud, feel-goodcomic fantasy about a reluctant superhero in a crusade to save his neighborhood. Move over, Superman! spineless Jefferson Reed (Robert Townsend) has just discovered his backbone... and it's stronger then steel! a mild-mannered subsitute teacher, Jefferson would rather run then fight... until he's hit by a strange green meteor that gives himn superhuman abilities. And when a gang led by a powerful drug lord begins terrorizing his family and neighbors, Jefferson has no choice but to don his homemade spandex suit and take them in a war of cunning, wit... and super-powered super-modeling prowess... to save his 'hood! My daughter, Brittany wanted to watch a comedy with me... so I let her choose one of the comedies in my collection... and this is what she decided on. Another Superhero spoof. It is pretty fun though... nothing extraordinary... but has some fun moments and a lot of familiar faces. Worth checking out... but not something I would put too much money into. I got my copy on sale for $4.95... not sure I would have paid much more then that though. Funnyman Adam Sandler stars in 'Mr. Deeds', the hilarious re-make of the classic American comedy 'Mr. Deeds Goes to Town'. Small-town guy Longfellow Deeds (SANDLER) goes to the big city to collect a $40 billion inheritance from a long lost uncle. Living in a palatial mansion with the services of an unusual personal butler (JOHN TUTURRO) isn't too bad. Things get even better when he meets a beautiful school nurse (WINONA RYDER). But money changes everything, and things aren't what they seem -- his sweetie is actually journalist feeding reports of his outrageous behavior to the press! Now, it's up to Deeds to straighten everybody out -- with a few right hooks and a lot of common sense. A lot of people I know dislike Adam Sandler... but for some reason I always got a kick out of him... and this one is no exception. Matter of fact this is one of my favorites of his movies. The movie is a lot of fun.... and picked it because I thought is would be a good companion piece to Brewster's Millions. How comes? He makes funny comedies (Big Daddy, Chuck & Larry) as well as more serious one (Spanglish, Click) and something in between (50 First Dates). I really like his movies. tell me about it... I always liked him too... but who knows.... a lot of people I know around here is like... You like him!?!?! I have about 14 movies where he stars in. Could it be, that I like his movies too? Recently I saw him in one of his early roles when I was watching my Cosby Show sets (as one of Theo's High School friends).